In response to the electronics ban, Doha-based Qatar Airways is offering passengers a replacement laptop on flights to the US. 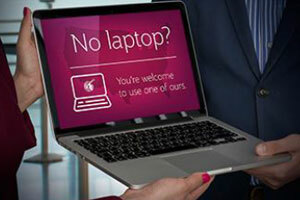 According to officials, the “Laptop Loan” service ensures business travellers can continue to work as they travel on Qatar flights. The complimentary PC laptops will be available to Business Class passengers traveling on all US-bound flights and can be collected after boarding. Customers will be able to download their work on to a USB before stepping on board to pick up where they left off. Qatar Airways is also offering a special service at the gate for all passengers, whereby any electronic items prohibited by the new ban will be collected and securely packaged. These will be tagged, loaded as check-in baggage, and returned safely to the customer on arrival to the US. Once on board, passengers have a choice of more than 3,000 entertainment options on the award-winning Oryx One in-flight entertainment system.